The GUNNER24 Forecasting Method provides us with a completely new and frequently very successful tool in the cycle technique. By that we recognize the market moves and the possible points of change in the market earlier than others do, thus we gain safety in our trades, in addition being able to anticipate some possible market moves. Until 02/18, the US markets were supported by the green double arc. From 02/21 at first the futures and subsequently on 02/22 the stock markets began to decline rapidly. In order to reply to the collective client e-mails in one go let me briefly take a stand putting the cart before the horse again. The starting point for assuming that from 02/21 onwards something had to happen in the S&P 500 is the "normal" weekly 8 Candle GUNNER24 Up. Initiated by the significant March 09 low the initial impulse started throughout 8 weeks. The extension of the initial impulse in price and time nailed down the bulk of the market participants who were trading in the market at that time. They determined then: "Now, at first we let the market rise for 8 weeks with a range of almost 205 points". The period of time and the price range of the initial impulse establish so to speak invisibly all the possible prospective rallies, crashes, swings, corrections, important points of change, big changes in trend, simply the "future" course of a market for all the market participants who were involved in the working model of the initial impulse AND for all the other persons acting in the market afterwards. All the market participants, being interconnected (swarm intelligence), orient themselves by those invisible fixed points just like bird or sardine swarms do. That probable future development is made visible to us by GUNNER24 and, being traders with our corresponding experience and preparation we are able to anticipate the likely reactions of the market participants and to trade successfully. The situation: In the weekly 8 Candle GUNNER24 Up Setup we can see that the market broke the 4th double arc four weeks ago. 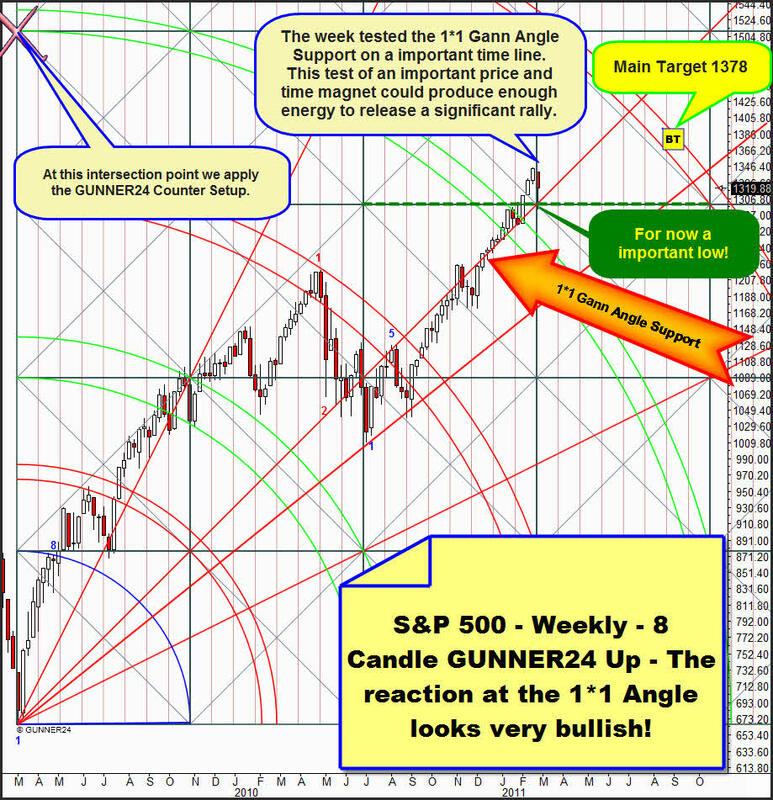 By the decline off last week it "actually" just tested the 1*1 Gann Angle rebounding from it impressively. Since in addition it happened exactly on an important price and time magnet (limitation of the square) the rebound from the 1*1 Gann Angle might generate enough energy to head directly for the main target (1378). Above left at the intersection point we apply now the weekly counter setup which signals the important point of change 02/21 and the green support double arc. We see that the lower limit of the green support double arc was reached by the last week low. A violent rebound followed. Let’s consider now the orange circle, that’s where the corresponding week candle touched briefly underneath the double arc, then a mighty rebound upwards followed. The difference between the situations of today and then is this: Now the market is within the temporal influence of the double arc. That means for us that this area is NOT exactly predictable concerning the future tendency oscillations of the market. It may go up as well as down! But within the temporal influence we can nearly always see that the volatility of the market really rises rapidly…which for us traders also means a very important information after all. Very often within the temporal influence the market begins to "jump" fast, up, down, up or down…which last trading week showed as well. Now, at a 60 to 65% of probability I suppose we’ll pop upwards. The strong rebound from the lower line of the green support double arc makes me guess so. If the supposition results to be right the market should run upwards for two more weeks from Monday until the 1378 target where a strong resistance is residing, the resistance Gann Angle. 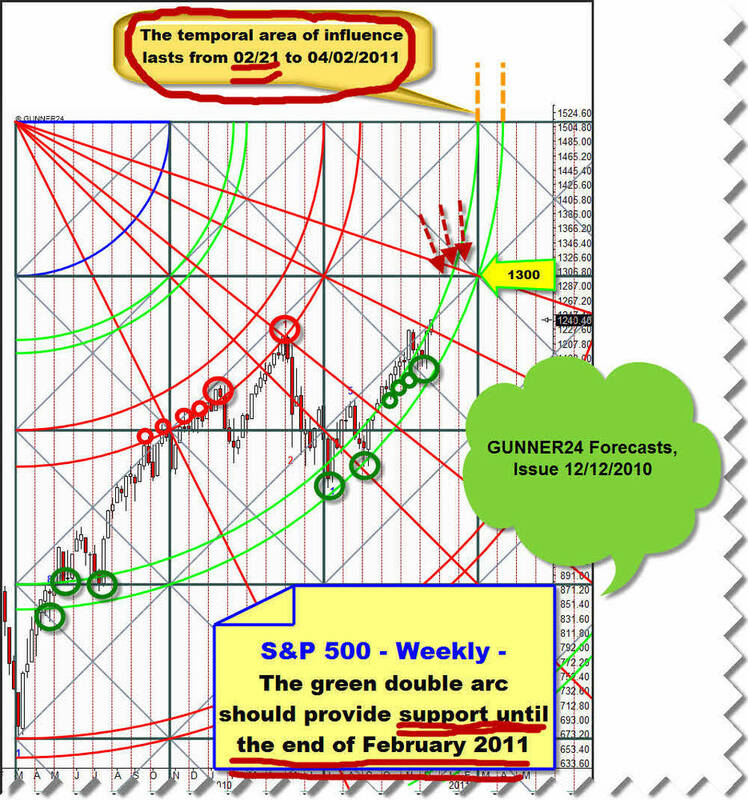 The situation: The downwards swing was stopped by the support Gann Angle. 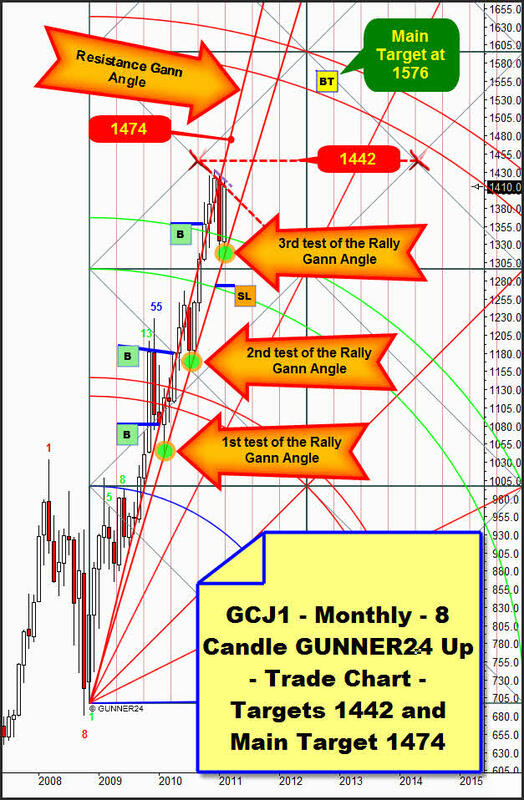 The Friday candle closed again in the Gann Angle corridor (gray backed) and in the upper half of the setup… and in the bullish half (green backed). That counter reaction and the possible recapture as well of the Gann Angle corridor as of the bullish half of the setup is to be interpreted as to be very bullish at first. In addition there is the 1340 Gap there which "actually" wants to be closed. But since it takes more than a swallow to make a summer we’ll have to await the final break of the 4th double arc for a possible long entry. Target in the daily setup will go on being the 1378 through the coming two weeks. 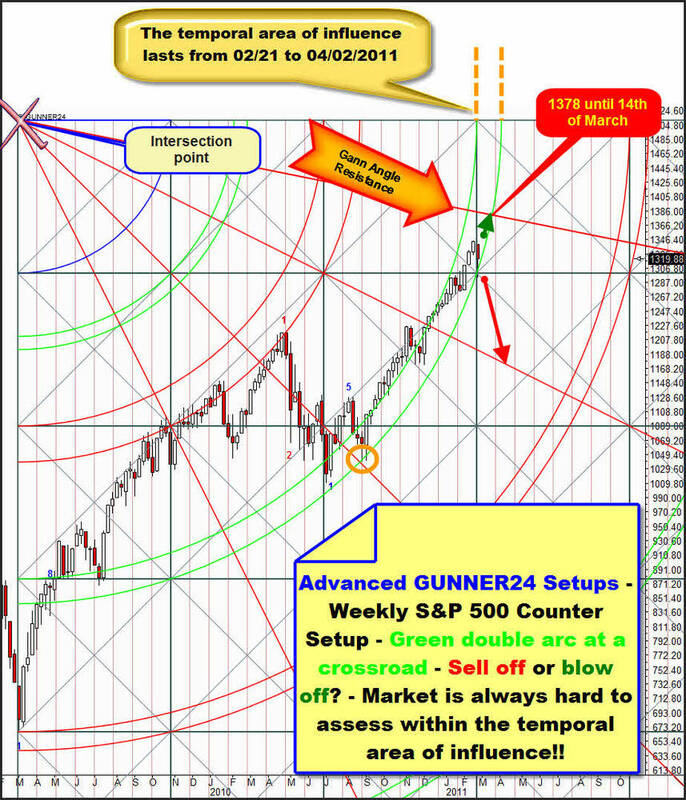 If the daily support Gann Angle is broken downwards on daily basis we’ll go short with target 1254 because in that case not only in the daily time frame a short signal would be triggered but also the temporal influence of the green double arc in the weekly time frame would be supposed to turn out as a price pusher correspondingly affecting the markets in a negative way for the next four to five trading weeks. 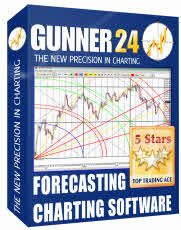 The GUNNER24 Forecasting Charting Software will show you a completely new and highly successful cycle technique. You will recognize turnarounds with bull’s eye precision in advance and, most importantly, you will also be able to see at which price levels the cycles will in fact change. After a brief period of learning, you will already have developed the skill to anticipate market movements. The special GUNNER24 Cycle Technique will open your thinking to a completely novel approach. You will identify milestones of paradigm shifts that have absolutely nothing in common with the conventional and obsolete cycle technique. They are absolutely innovative and have not yet been discovered. Order now! After the strong Friday Monday should be solid as well. Even though gold opens at only about 1408 punctually on Tuesday 03/01 with the opening of the March candle the monthly resistance diagonal will be overcome since it will be so to speak "over-jumped" temporally and thus broken. 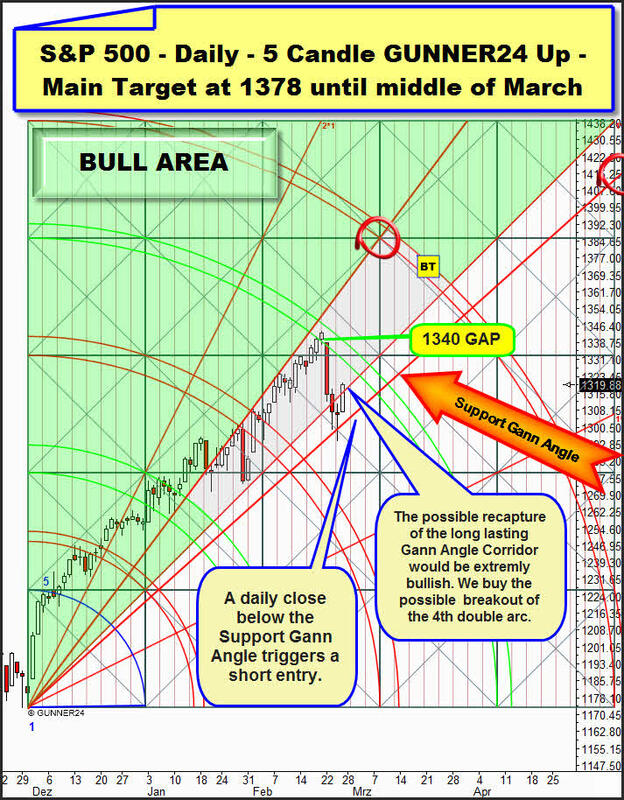 For March that would open the gate to our important weekly target of 1474 which is corresponding with the resistance Gann Angle in the monthly time frame. After the final break of the resistance diagonal I suppose there’ll be a "rather" stubborn ascent, there are too many hurdles to overcome: A) The lost motion of the resistance diagonal at 1418 (purple dotted), B) the all-time high at 1434, then threatens C) already the monthly resistance horizontal at 1442. All in all things should rather go on as they’ve gone so far: Two steps forward, one step back and so on. It’s a classical upwards trend which – like always – should result very nerve-racking for the bears. Here’s the actual state in the daily setup: In contrast to my former supposition that the 21st day of the upswing should mark a top at the second double arc, the actual top for this upswing was marked as early as the 20th day. But since the 2nd doubled arc has to be reached somehow, even just by a quick touch of the lower line of the 2nd double arc, now I can commit to the prediction that we’ll probably see at least 34 days with furthermore rising prices: A) The 22nd day (next Monday) makes a touch of the 2nd double arc by the position of the resistance Gann Angle seem to be almost impossible. I.e. B) It won’t possible before the 23rd day (Tuesday) or the 24th day (Wednesday), respectively. And since the swings don’t end at their 23rd or 24th day we’ll have to assume a 34 day swing! Since the jump over the monthly resistance diagonal from Tuesday on (see above) releases new upwards energy we can moreover assume that by the end of next week at the latest a closing price within the daily 2nd double arc shall have taken place and thereby the congruent daily, weekly and monthly target at 1474 should have to be headed for in the course of the next three weeks. 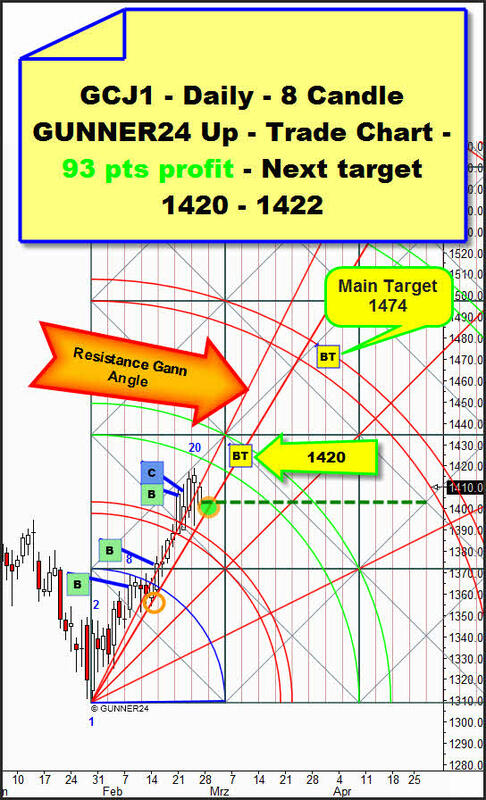 By virtue of that supposed course, on Monday we’ll look for the long entry with target 1420-1422 and main target 1474 in the environment of the green dotted support diagonal.